The Eastern Hemisphere has thousands of years under its history belt and thousands of years for each of its countries to cement their cultural identities through clothes, food, and drink. However, the USA has had only a few short centuries to work on its cultural image. Therefore, cultural intermingling has been relied on in its quest for a unique cultural identity in comparison to the rest of the world. As American as - Beer? Over 40 years ago Chevrolet forever associated apple pie, hot dogs, and baseball with America when its jingle "...baseball, hot dogs, apple pie, and Chevrolet..." hit the airwaves. But each of these listed items has a whisper of foreign flavor including the automobile's brand name! Likewise, most adult beverages in America can't claim cultural invention despite hundreds of breweries and wineries that dot the nation. Citing a Native American drink made from maize, birch sap, and water plus the power house breweries in the Midwest, some may claim beer as the national beverage mainstay. However, Germany corners beer as a cultural symbol with images of Oktoberfest dancers with trays filled with overflowing mugs of beer. So if beer isn't uniquely American, then some may demand wine has to make the list. Although California wine country produces over 88% of wine in the USA, and the USA is the world's fourth largest producer of wine, the production is thanks to Europeans bringing Vitis vinifera into the country because native grapes produced inferior tasting wines. Furthermore, with names like Pino Grigio, Cabernet Sauvignon, and Champagne, the realization is clear that most wines have as French a connotation as the town names they carry. So it seems wine is also out as a cultural symbol of the USA. The British favor their gin, vodka can't be anything but Russian, and who can think of Mexico without conjuring up tequila? The USA must look to a close neighbor to find a distinctive drink that can at least claim New World status. The Caribbean Islands, with a history timeline similar to the USA, can claim the rum produced by successful families like Bacardi Cuba as a representation of their culture. The search for a symbolic adult American beverage to complement the food on its tables owes a debt to rum distilleries in the Caribbean. Although rum itself isn't uniquely American, some drinks owe their existence to a few of its citizens. For instance, an American engineer invented the daiquiri while working in Cuba and American soldiers requested their colas be imbued with rum. 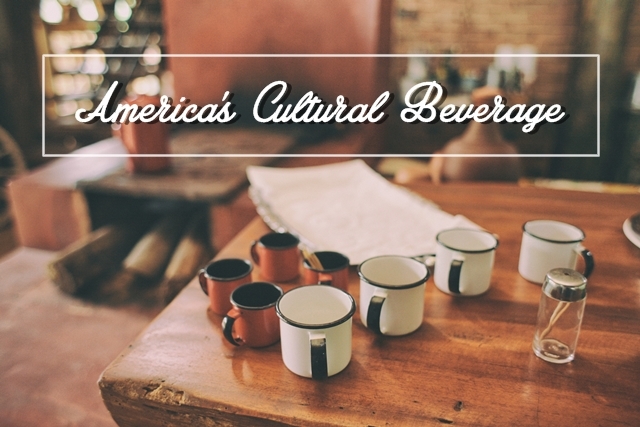 Adult beverages, like so many other cultural symbols in the USA, have been borrowed from other countries and exemplify the ingenuity involved in its complicated cultural heritage.